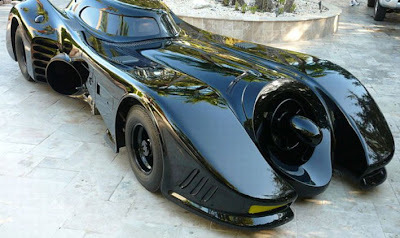 Holy Moley, we like Batmobiles, but $370,100 USD (£232,000 GBP) is stretching the SMN wallet way past breaking point. But eBay buyers certainly didn’t think so, for that’s what the befinned black beast (top pic above) that starred in two Tim Burton Batman movies fetched on Wednesday this week. Mind you, the car - from Batman (1989) and Batman Returns (1992) - didn’t hit the ‘Buy It Now’ price of $499,000. For power, Burton’s Batmobile had an ‘atomic-turbine’ engine, with a neat flamethrower-style exhaust, just the thing to toast the toes of an unwary bad guy. The real thing that just found a new buyer has a somewhat more prosaic Chevy 350 cu in engine, though we have to admit even that puts the tiny three-cylinder motor that powers the SMN Ibiza in the shade! 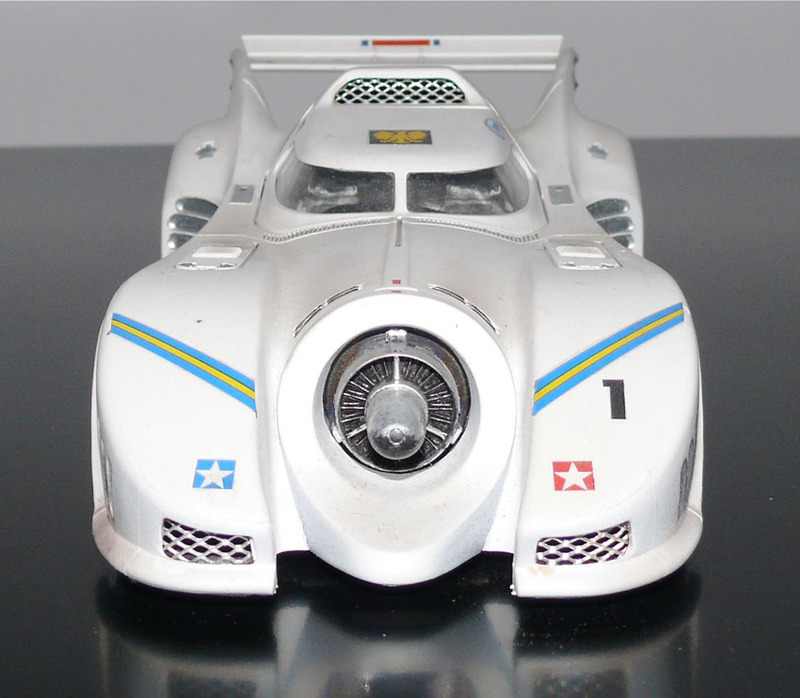 The white-finish Batmobile we show here originated with the 235 mm (9.25 in) long 1:25 scale AMT kit, and conceptually describes what Batman did with his car when he retired from the crimefighting business. 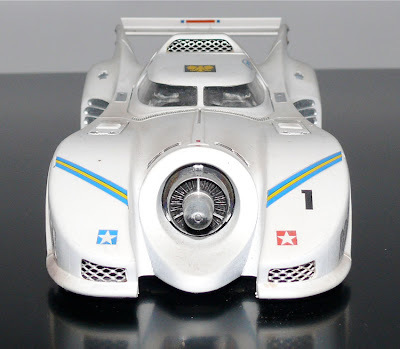 Yep, it’s a 'mature driver' race version, with a few extras to make it street-legal, such as the wire-mesh flameguard around the atomic exhaust, and removal of the weaponry. 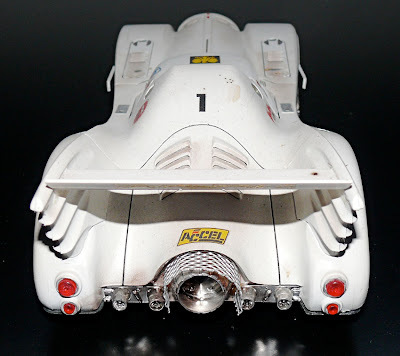 A rear spoiler between the fins keeps the Batmobile firmly on the tarmac when it’s nailing around a race track, and flipout side-strakes adjust the airflow through tight twisties. We’re not too sure what racing class this Batmobile should be in - maybe ‘classic cars’ with appropriate handicap. 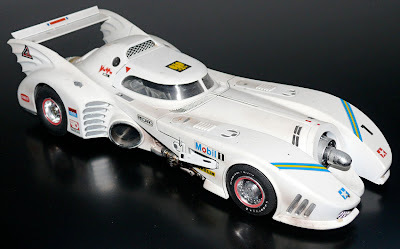 The white finish gives it a totally different feel from all the other Batmobiles, and suitable decals and some carefully airbrushed weathering give the model that well-used look. Batmobiles you can buy today in kit form are rather thin on the ground, though diecasts and toys appear randomly all over, from Toys ‘R’ Us to your local corner store. Here are some to browse, at the UK’s sci-fi store chain Forbidden Planet. As you’ll see when you hit the link, four are on special offer, while the upcoming Polar Lights snap-kit features too. This 1:25 scale kit is due for release in May 2011, and is based on the classic 1960s TV series design by US customizer George Barris. It’s looking like an interesting kit, especially as scale figures of the dynamic duo, Batman and Robin, are included. More on this nearer release date, when we get a sample here in SMN Towers. Thanks to PistonHeads for the auction heads-up.